Anna Hannigan and Quinn Shaughnessy have been best friends since they were six years old when the Hannigans moved next door to the Shaughnessys, and Anna has been in love with Quinn almost as long. Unfortunately, her love is unrequited. Quinn sees Anna strictly as his best bud, just one of the guys. Anna exchanges her job at a local pub, a jeans-and-tee shirt position, for a career in real estate that requires more feminine attire, not as an upwardly mobile career move but as a way to make others see her differently. But the change is not enough to alter Quinn’s perspective. Quinn, a former NASCAR driver, is a serial dater whose only serious commitment is to his business, a chain of auto repair and restoration shops. When he arrives at the beach site where the wedding of his brother Aidan and Zoe Dalton (Made for Us) is taking place, Quinn sees a curvy beauty in a bikini and is set to make his move when he realizes the beauty is Anna. Then he insists she cover up all that she is exposing. He is uncomfortable seeing Anna as a woman who stirs his libido, and he fights the attraction until desire proves more powerful than fear. But this couple still has major obstacles to overcome. The pattern of Anna and Quinn’s relationship, with Anna as the giver and Quinn as the taker, is a long-established one, and it does not change when they become lovers. 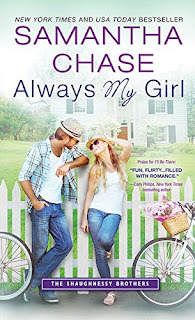 Anna has to learn to assert herself and Quinn has to lose the selfish jerk he often is before this romance has any hope of leading to forever. This is the third novel in Samantha Chase’s Shaughnessy Brothers series, and it has the strengths and the weaknesses of the first novel. The characters are deftly drawn with intriguing layers, and the Shaughnessy family dynamics, including the effect of their mother’s death on each of them, are complex and interesting. Anna has been part of their family for so long that they regard her as one of their own. The affection they have for her complicates matters when she and Quinn move from friends to lovers. I found Anna a sympathetic character. Even when I cringed at her patient Griselda ways, I understood her and rooted for her to take a stand. All of these factors make for an interesting, engaging read. But Quinn, like Aidan before him, is a hero with a high jerk quotient. In fact, in a contest for jerkiness, Quinn would be the winner. For much of the story, he is selfish and self-absorbed, incapable of seeing any view but his own. Flawed characters often win my heart, but the flaws need to be balanced by appealing qualities. For me, Quinn failed the balance test. Even the transformed Quinn is not enough to overcome my initial dislike. Final verdict: I wavered between 3.5 and 4 stars for quite a while before settling on 4. As a small-town romance, Always My Girl deserves kudos for its solid characterization and credible creation of tangled familial ties and strong sense of community. Chase excels in weaving humor and poignancy into her stories, and she does not disappoint with this one. Some readers may find Quinn more likeable than I did. Regardless, I like the Shaughnessy family enough to have added This Is Our Song (December 6, 2016), rock star Riley’s story, to my book calendar. I haven't started the Shaughnessy series yet. Good to know about Quinn.